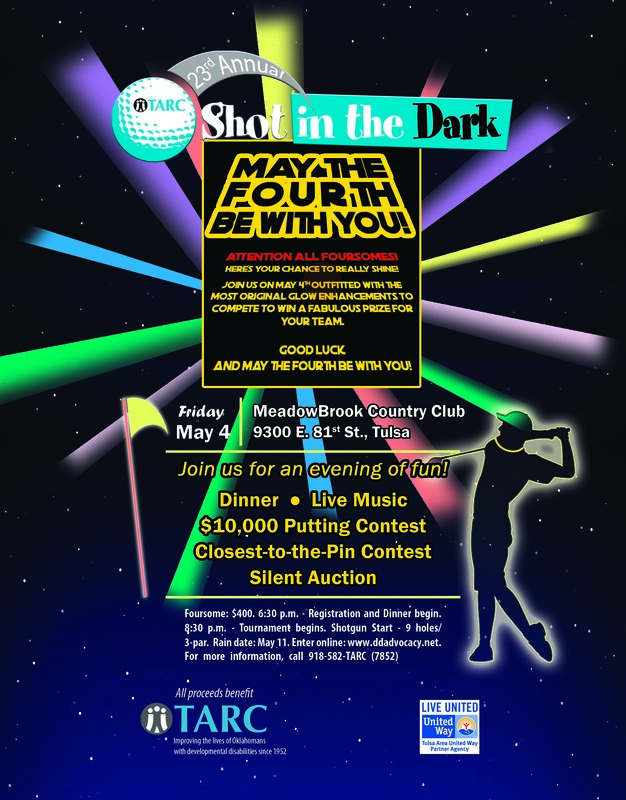 2018 Shot In The Dark Golf Tournament – May The Fourth Be With You! To enter the tournament or sign up for a sponsorship, please click HERE. New this year will be a twilight tee off time of 8:30 p.m. at MeadowBrook Country Club in Tulsa. In addition to the tournament, golfers will be feted with dinner, live music with Terry & Breanna, $10,000 prize putting contest, silent auction, and closest-to-the-pin contest with prizes. This unique tournament is played at night with glow-in-the-dark balls and LED glow sticks marking tee boxes and holes. Golfers will tee off in teams of four at the 8:30 p.m. shotgun start. All holes are reset to par three and the golfers navigate the course playing nine holes. The dinner and putting contest will be held from 6:30 until 8:30 p.m. and the silent auction from 6:30 p.m. through the tournament awards ceremony. All proceeds from the TARC Shot in the Dark Golf Tournament are used to support programs and services helping individuals with developmental disabilities and their families with needs such as special education assistance, multi-age support groups, self-advocacy and social skills training, as well as loss and grief support. The tournament entry fee* for foursomes is $400. The number of teams is limited and will be accepted on a first-come-first-served basis. Tournament entrants are encouraged to come decorated with glow paraphernalia. The best glowing team will be awarded a prize. Tournament sponsorships* are still available. *Entry/Sponsorship fees minus goods and services are tax deductible. No refunds.